This series is based on the Awareness Course that is incorporated at the post-graduate level programs of the Sri Sathya Sai Institute of Higher Learning. Its author is this University’s former Vice-Chancellor Professor G. Venkataraman, who has been closely connected with the formulation, content and delivery of this program for more than a decade now. The series was first broadcast over Radio Sai in response to requests from many listeners seeking clarifications on many spiritual dilemmas faced in daily life. It was therefore presented in a simple format suited for anyone who wishes to live life in a state of Awareness as prescribed by the Supreme Teacher Bhagavan Sri Sathya Sai Baba. The present article, the ninth talk in this series, has been adapted appropriately and supplemented with apt illustrations for ease of understanding. Loving Sai Ram and greetings from Prashanti Nilayam. In this article I wish to give you a detailed review of what I have said in my previous eight articles in the Awareness series. The individual is the microcosm while Society is the macrocosm. Since Divinity is latent in the individual, Divinity is latent also in Society, in fact on a macro scale. If the individual does not allow his or her Divinity to manifest, then there is a slim chance of a macro manifestation of Divinity in Society. And if Divinity is prevented by individuals from having its full play in Society, then Society would be in all kinds of troubles, as in fact it presently is. So you see, whether we like it or not, practical Spirituality has everything to do with not only the individual, but also the relationship of the individual to Society and to Nature. It is to stress this important fact that Swami often tells His students that we are what we are because of Society and that we therefore owe a lot to Society, indeed much more than what we think Society owes to us. This is what I pointed out after my general introduction. Since God is present in everything, everywhere, all the time, almost all our actions acquire a spiritual undertone. 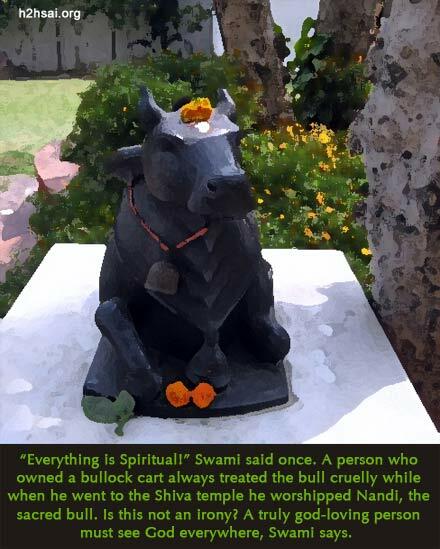 In fact, stressing this, Swami once told me: “Everything is Spiritual!” In the old days, Swami used to describe a man who owned a bullock cart. This man was very cruel in treating the bull and yet when he visited the local Siva temple, this very same man would worship reverentially the idol of Nandi located at the entrance of the temple. Nandi whose idol always adorns the entrance of every Siva temple is the bull that serves as Siva’s vehicle. Swami says: “Is it not an irony that this man worships a stone idol of the bull but is very cruel to the living bull that he owns?” That is the type of contradiction that creeps into the life of practically every person who claims to be a devotee of God in general and Swami in particular but ignores the Omnipresence of God. And this contradiction manifests because the person concerned simply refuses to come to terms with the Omnipresence of God. You might recall that I went into great details concerning this, using a concept called ‘The Golden Triangle’. The question now is: “How do we become so insensitive to the obvious?” That is related to our gunas, which grow from our natural tendencies shaped in earlier births. 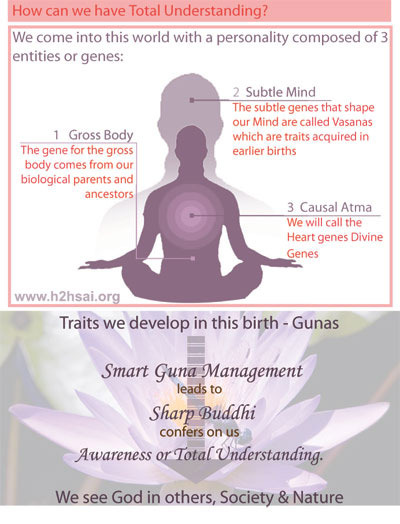 These latent tendencies encoded in earlier births are called vasanas, and they form the seeds for the gunas one sees in the present life of the person concerned. Gunas will develop partly controlled by latent vasanas and partly by environment in which a person lives. However, a person can, with determination, actually shape and modify his guna pattern so as to help him or her to advance spiritually. Man must be first aware of his Cosmic Origin. Next, man must be aware of his Cosmic Connection. He does not simply exist in isolation, free to do what he wants, the way he wants, and when he wants. This is not true. Krishna makes that very clear, and Swami has added clarifications relevant to this day and age – all this I have pointed out. Becoming aware of one’s Cosmic Connection brings with it Cosmic Responsibilities. In practical terms, one cannot act in ways that harm Society and or Nature. Finally, man must be aware of his Cosmic Destiny, which is that life is a blessing given so that man can become permanently reunited with his Creator. So there are these four Cosmic aspects to human life: Cosmic Origin, Cosmic Connection, Cosmic Responsibilities, and Cosmic Destiny. As Swami says, the purpose of life is to go back to where we came from. From God we have come, and to God we must return. That is really the goal of life, and no one is exempted, repeat, NO ONE! OK, let us say that we become aware that Cosmic Omnipresence pervades the whole of Creation. What next? I pointed out that this Cosmic Omnipresence actually pervades the Universe at three distinct levels. The first is the gross, the second is the subtle and beyond these both is the Causal. There is also a higher and a third level of Omnipresence, very important I must add, at which God is present in human beings. I told you that this level of presence of the Divine is unique to humans, which is why Swami reminds us repeatedly that human birth is a priceless gift. This is the level of Consciousness. Human Consciousness itself has many strata. At the lower end it makes one conscious of beauty, for example. Thus it is that you and I are able to enjoy the sight of a beautiful sunset unlike say a tiger or a crow. At a slightly higher level, human Consciousness awakens us to the sufferings of others and enables us to reach out to them with help. At a still higher level, we are able to cognise that there exists a God whose children we all are and from whom came everything. Rising up one notch, we become aware that that God actually resides in our Heart and is ever ready to speak to us as well as advice us as the Voice of Conscience. Of course, for this to happen, we must keep the communication channel in good working condition, which is to say that our Buddhi (discrimination) ought to be in top form. And when one rises to this level, it is one short step [but a difficult one I must warn you], to realise that the same God dwells in all beings, and indeed in all entities in creation. Once you grant that Consciousness pervades the entire Universe and is also the source of all feelings as well as of all energy, both inanimate and animate, we just cannot afford to ignore it. Rather, we had better be constantly aware of it, and tune our actions accordingly. I stated two rules in this connection and let me recall them once more. Rule One: Act in the transient world, but according to eternal guidelines and in harmony with the permanent basis of creation. I started by stating that I am trying to discuss the Omnipresence of God. This Omnipresent God I am talking of is the Abstract, Formless God. 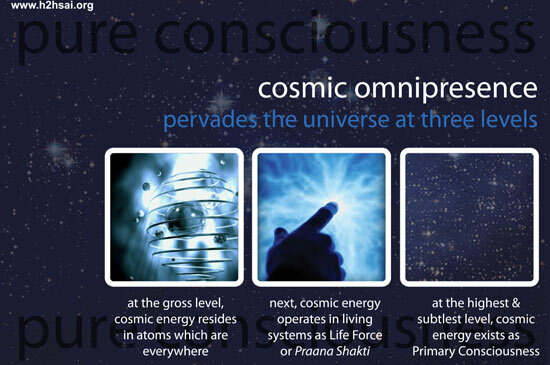 In the manifested Universe, God is present in three distinct aspects. Firstly, God is present as the power immanent in the atom. Since atoms are to be found everywhere in the Universe, God too is immanent everywhere in the manifested Universe. Scientists may be able to give a physical explanation for the presence of energy in the atom; but, according to me, the question remains, “Where did that energy originally come from?” This is where Gandhi’s observation about an ‘indefinable mysterious power’ pervading the Universe becomes very pertinent. The Omnipresence that I just mentioned is common to inert as well as living beings. In living beings, God is present or immanent at a still higher level also, that of Praana or the Life Force. There is a still higher level, which is the level of Pure Consciousness. This is present in an active form in humans. It is this that enables humans to see God, if they want, both within and without. Pure Consciousness is Supreme, which means it can exist all by itself. Stated differently, when the Universe disappears, it dissolves into Pure Consciousness, as Krishna explained to Arjuna. One should not imagine that when the Universe is created, the primordial background of Universal Consciousness disappears. The latter continues to exist, acting as a backdrop in the manifested Universe. I hold that this backdrop acts rather like a physical field driving evolution of living species in the direction where Consciousness flowers fully, like a fruit bud growing and ripening into a sweet fruit. Where evolution of life is concerned, that fruit is the human being. Suppose one grants all this, what is the bottom line? According to me, it is the following: Man must be aware that he is a spark of the Divine, and that this Divine is Omnipresent in the manifested Universe in every single entity, both inanimate and animate in many different forms. This subtle and universal presence of the Lord is not very obvious at first sight, which is why we often lose sight of Him. However we should not, and we must ensure that every single act of ours does not cause harm to our spiritual progress, does not harm Society and finally does not either contradict or disturb Nature in any way. If we do this regularly, meticulously, and consciously, keeping God in our mind all the time, then we are in fact adhering to our duties. The question that is often asked is: “If God is actually within everyone all the time, how come man so easily forgets God?” This is an old question and the short answer to it is that this forgetfulness is all due to the gunas. Gunas, if not properly shaped and managed, can easily lead us astray, especially in today’s world which is so full of distractions meant to deliberately trap us in self indulgence and sensuous living. If we must avoid the hazards, we must pay attention to the warning signals that come from the Voice of Conscience. As I mentioned earlier, our Conscience is the Voice of God speaking from within. Being soft, this voice can easily be drowned out by the constant chatter of the Mind. In turn this means that one who wants to hear God speaking from within had better learn to a) keep his mouth shut most of the time, and b) extend that by training his Mind to dwell on God most of the time. That in turn means that we must keep the pipeline called Buddhi in top condition. Once Buddhi is sparkling clean and ready for business, then we can dial the Conscience anytime. This is the first step, becoming aware of the presence of God within and learning to consult God on all matters of Sathya and Dharma (Truth and Righteousness). I now wish to say something about Consciousness, since that is very crucial where humans are concerned. You might recall that in my earlier articles I used two terms – Individual Conscience and Universal Consciousness. Maybe I should redefine these for your benefit. What exactly are these and what is the connection between them if any? 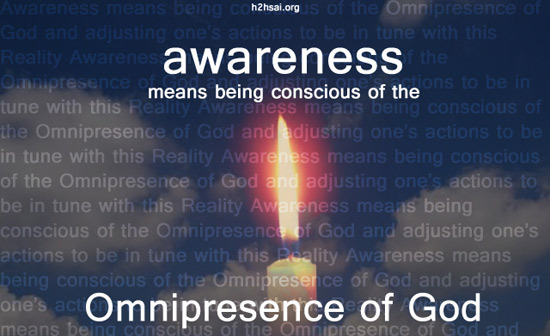 Once we understand this, the question of what awareness is all about would become immediately clear. Individual Conscience is an aspect of God specific to individuals, and acting as an internal as well as a personal advisor. Where did this Conscience come from? From Universal Consciousness. There are billions of individuals and each one has his or her own Individual Conscience. However, this does not mean that each person has a distinct Conscience that has no connection with that of others. Krishna makes it very clear that there is only ONE Universal Consciousness and that a bit of it functions in each individual to guide that one particular person. But once an individual realises that all so-called different Consciences really are parts of one universal whole, then one’s perspective of creation changes completely. OK, so we agree that the Conscience present in different individuals may appear individual-specific but it is all a part of ONE Universal Consciousness, from which our Universe and everything in it came into existence. Realising this is what awareness is all about. In other words, Individual Conscience and Universal Consciousness are one, and synonymous with God. They pervade everything, all the time. However, while Individual Consciousness has meaning only when there is diversity, i.e., after Creation, Universal Consciousness exists all by itself even when Creation is dissolved. To put it differently, Individual Consciousness is the micro aspect while Universal Consciousness is the macro aspect. Of course, when there is no Creation, there is only Absolute Oneness. I am sure you are wondering whether this thing I am referring to as Universal Consciousness is the same as Atma; indeed it is and that is precisely what the Upanishads also declare. A few more points. A question often asked is: “Is there God in a murderer? If so why does he commit murder?” A related question: “If God is Omnipresent, why is there so much evil?” In a sense I have already dealt with this issue. Basically it is all about being disconnected with the Heart. That by the way is why cruel people are often described as ‘heartless’. Individual Consciousness has meaning only when there is diversity, i.e., after Creation, Universal Consciousness exists all by itself even when Creation is dissolved. To put it differently, Individual Consciousness is the micro aspect while Universal Consciousness is the macro aspect. Of course, when there is no Creation, there is only Absolute Oneness. I think it might help if I offer a summary again. When there is no Creation, He exists in the form Pure, Abstract Oneness, that is not easy for us humans to describe, bound as we are by the experience of Space and Time. But sages have recognised this Supreme State of Existence through their meditations, and Krishna has confirmed God existing as the Unmanifest Divinity. When God creates the Universe, it is not as if He disappears from the state of Unmanifest Existence to come down to the Universe and hides Himself there in various forms and aspects. He now exists in two states; that of Unmanifest Divinity as usual, and as the immanent God in Creation. I then pointed out that in creation, God is present everywhere in gross matter, as the energy of the atoms. In human beings, He is present in a still higher aspect as the Conscience. What is the meaning of a person being disconnected with his Heart? That happens when the Mind becomes entirely subservient to the senses. Obviously, this is also related to discrimination becoming totally blunted. You might recall that I discussed the issue of the Mind in one of my earlier articles. I pointed out then that to start with, what we call the Mind is really a continuum, extending from the Lower Mind at one end to the Higher Mind at the other, with the Middle Mind tucked in between. The Lower Mind performs essentially the functions we normally associate with the sense-brain combination. To be explicit, the senses collect information from the outside world and transmit it to the brain. There it is processed and action to be taken by the body is determined by the brain. And, depending on the decision of the brain, signals then go to the senses and the limbs of the body to guide its further action. I also pointed out that this kind of hard-wiring is present in animals too, and God has built this in for reasons of survival. Since we have evolved from animals, it is not surprising that these functions are present in humans also. In passing, I also pointed out that this conclusion, which is based on the findings of modern science is also the finding of Vedanta. Only, Vedanta uses different jargon, dividing the activity in terms of perception, and cognition. Moving beyond the Lower Mind, I then took you into the realm of the Middle Mind, which is the home of immense creativity. The Middle Mind is no doubt very fertile but also capable of trapping man into ego, which is the slippery slope connecting to disaster. God did not hard-wire the Middle Mind but left it free to either function independently or be guided by the Higher Mind. Naturally, man is responsible for the choice he makes! At this point, I pointed out that humans inherit three distinct kinds of genes. Bio genes from their parents and bodily ancestors, mental genes from earlier births – please note that one cannot blame the mental genes on ancestors – and finally, Divine Genes, which all of us get as a wonderful blessing from God. I then pointed out that the mental genes, which by the way are better known as Vasanas, play a crucial role in deciding the way the person shapes. Another topic that I discussed is the so-called P-N cycle, where P stands for Prasaadam or the gifts that God bestows on every individual while N stands for Naivedyam or the offerings we make to God. OK, so we understand what P and N stand for. What about the so-called P-N cycle? Well, it means that in life we receive innumerable gifts from God, and that in turn implies that all these gifts must be used in such a manner that whatever we do becomes an offering to God. After discussing the P-N cycle, I pointed out how the Trusteeship concept makes the P-N cycle automatic. By the way, Trusteeship concept allows all members of Society to simultaneously adopt this scheme. I also pointed out that the Trusteeship concept is best understood by analysing how the living human body works. 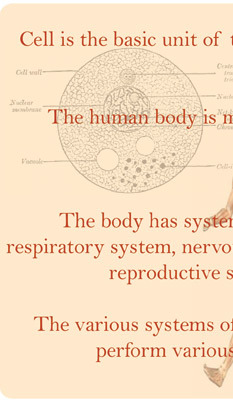 The human body is a complex biological system made up of cells. Cells make up the various organs of the body like eyes, stomach, liver, etc. Many organs link together to form a system. Examples include the respiratory system, the digestive system, the circulatory system, and so on. 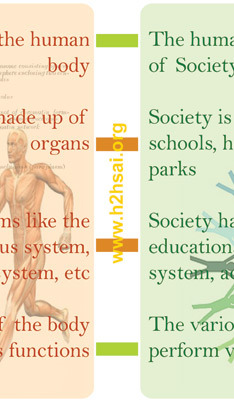 In a healthy human body, the systems do not function arbitrarily and in a disjointed fashion. Rather, they work in perfect harmony and synergy. For example, when a person runs, the heart pumps faster and blood is circulated more rapidly to the muscles of the legs particularly. Similarly, after a heavy meal, blood circulation to the brain is reduced because more blood has to be diverted to the stomach to deal with digestion. In fact, that is why one tends to feel a bit sleepy after a heavy meal! In short, it is a case of all for one and one for all. The cells work harmoniously through the organs and various systems to keep the body going, and the body for its part takes care of the organs and cells. It is this symbiosis that enables the body to be healthy. That briefly is what the Trusteeship principle is all about and I hope that the above recall would bring all the details I gave earlier. It is time to wind up and so let me start the closure formalities. I have said many things; but taken together, what do they mean? In brief, they tell us where individuals of today have to go; it is really a road map. If every individual follows it meticulously, then he or she as the case may be, would be actually following Mama Dharma, which is the essence of the Gita. But of course, hardly any one is doing that and when billions violate Mama Dharma there sure can be trouble, big trouble, as in fact we are finding out presently. The pressure for so-called progress drives Society towards complexity. 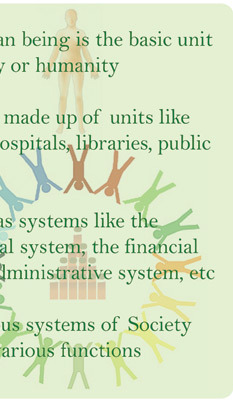 In turn, complexity generates more and more sectors, that is, it introduces diversity. Each sector inevitably has its own priorities, and the priorities of the different sectors often tend to clash. As the number of sectors increase, the clashes become more pronounced; they even tend to get violent at times. Even apex bodies like the UN where all are supposed to come together for common good, gets caught up in conflict and rivalries between different sectors or politica groups. I hope I have said enough for you to appreciate that the time has come for each and everyone of us to take Swami’s teachings far more seriously that we do at present. No doubt we routinely say, “Help ever, Hurt never”, “Love All, Serve All,” and things like that. But do we pause to enquire what exactly they mean? What happens when we hurt others? What happens when we serve but with selfish ends? And so on. Without a deeper understanding of what exactly Swami’s teachings imply, our approach to devotion, seva, etc., would be utterly superficial. Swami’s teachings are meant to make us better individuals no doubt; but they are also intended to help us mesh better into Society. The important point about Swami’s teachings at the present juncture is that we can no longer think of ourselves as individuals disconnected with Society. Nor must we labour under the illusion that our obligations, if any to Society have nothing to do with God. It is precisely that disconnect that has landed us in so much trouble. It is amazing how the Gita has packed in all these teachings as far back as five thousand years ago. Countless scholars have commented on it, but it is only Swami who has repeatedly drawn attention to the relevance of Society and Nature in the context of total devotion to God. You do not have to accept what I say but please do spend sometime thinking about to it.